The last local AKC retriever hunt test of the season is in the books. Beautiful property with fabulous water, good weather (yes, a bit hot) and lots of great dogs and their handlers. There was even a chocolate boy I’ve got my eye on! My co-judge, Jeff Baldwin, drove all the way from Utah to bake in the high plains sun while Wyoming lent us some of their wind every afternoon. After we designed the Senior test on Friday, he also judged Junior on Saturday while I worked at Master and then we judged Senior together on Sunday. It was a long weekend. So what did Jeff and I set up and why? The requirements for an AKC Senior test are a double retrieve on land and a double retrieve on water plus a land blind and a water blind. Then we have to throw in a live flyer, an honor, a walk-up, a diversion shot and multiple decoys and other trappings to simulate a real bird hunt. BLIND RETRIEVE – The dog is sent to retrieve a bird that it did not see fall. The dog is expected to take hand, voice and whistle signals to direct it to the bird. DIVERSION – Either a shot or a fall designed to divert the dog’s attention from the task at hand. DOUBLE – Two birds to retrieve. HONOR – Dog to sit quietly off-leash on or near the line while another dog retrieves. MARK – A retrieve that the dog has seen fall. MEMORY BIRD – First bird the dog sees thrown/shot on a multiple mark. Usually the last retrieved. STEADY – Dog does not leave assigned spot until instructed by the handler to retrieve. WALK-UP – Bird is thrown while handler and dog are walking with the dog at heel, much like jump shooting. We chose to start off with the land series in the morning and the water series afterward to give the dogs a chance to cool off in the afternoon heat. The first two photos were taken from the “line” – the spot where handlers bring their dogs to start the test. To begin, we ran a “test dog” (a dog who was not in contention) to make sure everything worked as we planned and to show all the handlers the test set up. Of course, the dogs in contention didn’t get to watch! After completing those two marks successfully, the test dog (and handler) moved to the “honor box” which is a spot nearby where the dog can watch the next dog work. Having just completed two retrieves the honor dog is often still excited, but must be “steady” (remain quietly in place, off leash) and watch the next dog retrieve the same marks. This is often a challenge for dogs at this level. Next the handlers brought their dogs one-by-one to the line. When they signaled they were ready, we had bird tech #1 throw a duck from a winger hidden behind a clump of trees near the left side of the field. The bird went from right to left and landed in some rather sparse cover, about 70 yards away. There were multiple goose decoys the dogs had to run through to get to the bird. 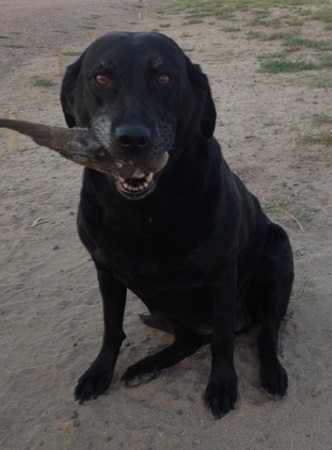 Just before throwing the bird, the bird tech blew a duck call and shot a blank to get the dog’s attention. As the birds are thrown, handlers must bring the shotgun to their shoulder like they were actually shooting. For safety reasons, the guns are disabled. Many dogs wanted to retrieve right away, but they had to be steady and wait for the second bird to be thrown – a “double retrieve.” This bird was a “flyer” (a live bird that was thrown and then shot in the air) which is very exciting for the dogs. All the other birds were already dead before being thrown. 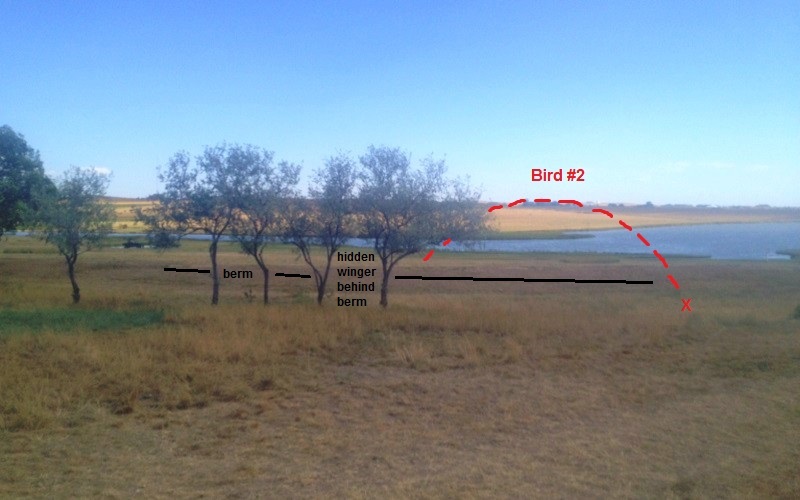 This bird #2 came out from a winger that was hidden behind the berm that ran parallel to and behind the line of trees. Flyers rarely land in exactly the same place for each dog so the distance to the bird varied, but averaged about 60 yards. Some dogs didn’t break, but couldn’t contain themselves completely and moved a little bit towards the birds. This is called a “creep” and is penalized, but less than a controlled break. Any dogs that moved beyond the length of the gun barrel had to return to heel before they could be sent to retrieve. After both birds were down, we gave the handler permission to send his dog. They could pick up the birds in any order, but usually chose to get the last bird down first. This is especially so when that bird is a flyer! After delivering one of the birds “to hand” they were sent to retrieve the other bird. After the working dog was sent on the first retrieve, we dismissed the honor dog. Sometimes dogs forgot where the other bird landed and had a big hunt or started back towards where they already found a bird. Returning to an old fall and switching are both disqualifications. They are similar faults, but “returning to an old fall” is going back to where they already retrieved a bird while “switching” is abandoning a hunt for one bird to go to a different bird. If the working dog did a passable job on the double retrieve, they next had a “blind retrieve.” This is picking up a bird the dog didn’t see fall and so had to be directed to it. We “planted the blind” (placed a bird in a specific location when the dog wasn’t watching) near a small bush about 50 yards from the line. To get to the blind, the dog had to pass some larger bushes and diagonally cross a dirt track. 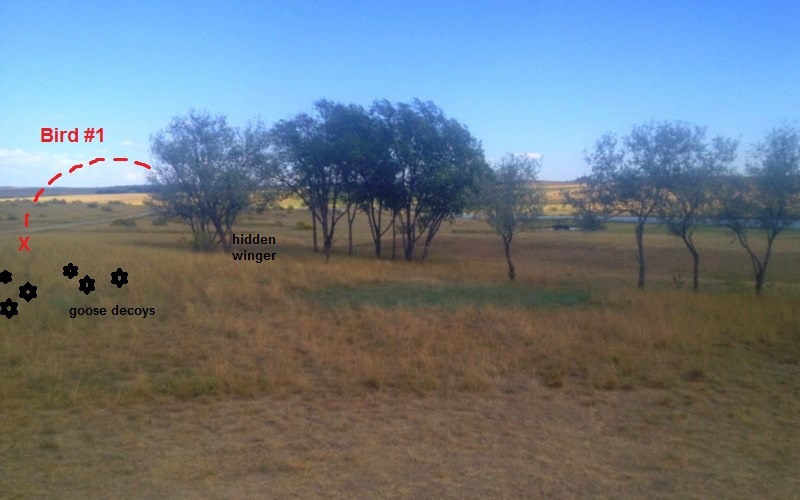 The location was to the left of bird #1 and slightly out of the left side of the first photo. 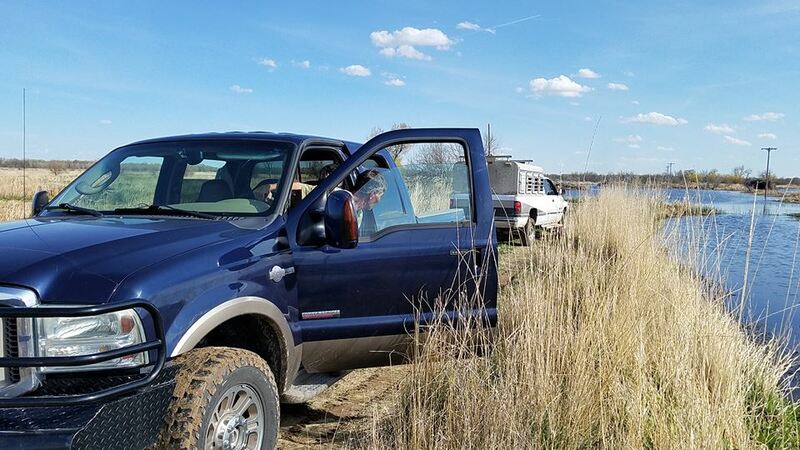 To get a passing score, the handlers had to “challenge the blind” by keeping their dogs close to a direct line to the blind and not let the dog run all around in hopes that he would eventually find it on his own. Dogs were penalized each time they didn’t stop on the whistle or take the correct cast or maintain the new direction for at least a few yards. Because Senior dogs are at an intermediate level of training and still learning how to apply their training in a field situation, each penalty was only counted as a minor deduction, provided they were making progress toward the blind. We repeated this sequence of double retrieve, blind retrieve and honor for 31 dogs – 29 in contention plus the test dog (who honored for the first dog) and a bye dog (who was asked to retrieve while the last dog in contention honored him). Dogs who had a passing score on land were “called back” to run the water series. We moved a 1/4 mile south to a spit of land with a water channel on the left side and open water on the right. This series was a double retrieve and a blind retrieve with a walk-up and a diversion shot. No honor, no live birds. We started with the handler walking down the spit with their dog at heel. 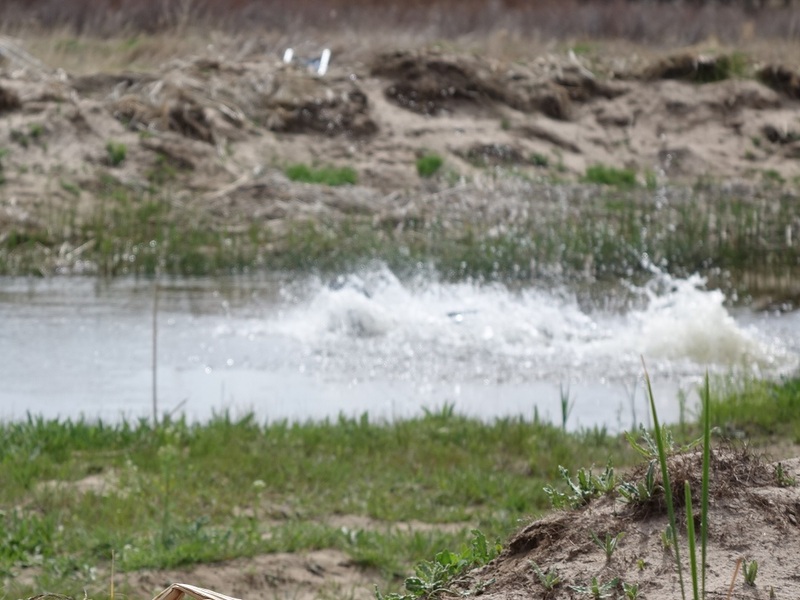 When they got to a certain point (known only to the judges), there was a gun shot and a bird was hand thrown to land in grass about 8-10″ tall and about 4-6′ from the water’s edge. The second bird came out slightly left to right, with another gun shot, and landed with a splash about half way down the channel. Both bird techs were hidden behind tall bushes. The dogs could retrieve the birds in any order, however when they were returning with bird #1, there was a diversion shot to set up the blind. Most dogs did fairly well to great on the water double retrieve. There were a few that needed to be handled and some who needed to be handled to both the memory bird on land and one of the birds on water. The blind was across to another spit of land and was placed just out of the water. Except for some suction to the old falls and to a tiny bit of land poking out of the water, this was a straight forward blind. All the dogs who attempted it did fine. Click the image to see a larger version. This is the same setup, just from a slightly different angle. Our goal as judges was to make both series as hunt-like as possible while staying within AKC’s rules for a Senior retriever hunt test. We also wanted the handlers and dogs to enjoy it and to make sure everyone was safe. Some dogs did very well overall, some did better on one series or the other and some had enough trouble that we couldn’t give them a ribbon this time. We got several compliments on the test set up, however in hindsight there are a couple of things I would tweak to make it an even better test. I’m grateful to the Mile High Golden Retriever Club for asking me to judge, to the owners and handlers who entered their dogs, to all the helpers for handling the myriad of jobs and to my co-judge who made it so easy, it felt like we’ve been working together for years. By the way, all of my dogs got to experience that great water. The adult dogs loved it. The younger ones quickly learned that the end of grass doesn’t always mean there’s a gentle slope into shallow water. =D And the drive home was rather quiet – except for some snoring coming from the back. People have relied on their dogs for help retrieving game for many years. Probably many, many, many years. As often happens when people get together, they’re compelled to see which dog is better. Thus the birth of competitive field trials. Not everyone has the time, money or desire to compete in field trials, but they sure do like to show off what their huntin’ dawgs can do! Thus the birth of the Hunting Retriever Club. “Conceived by Hunters for Hunters” became the motto of the HRC. Judges strive to set up realistic hunting scenarios with duck calls and camo, real birds and handlers shooting shotguns (albeit with blanks). Omar Driskill, Richard Walters and Bill Tarrant are some of the men instrumental in the founding of retriever hunt tests and the HRC. I was lucky to be able to run my first HRC test under Omar and still have the ribbon he awarded my dog! 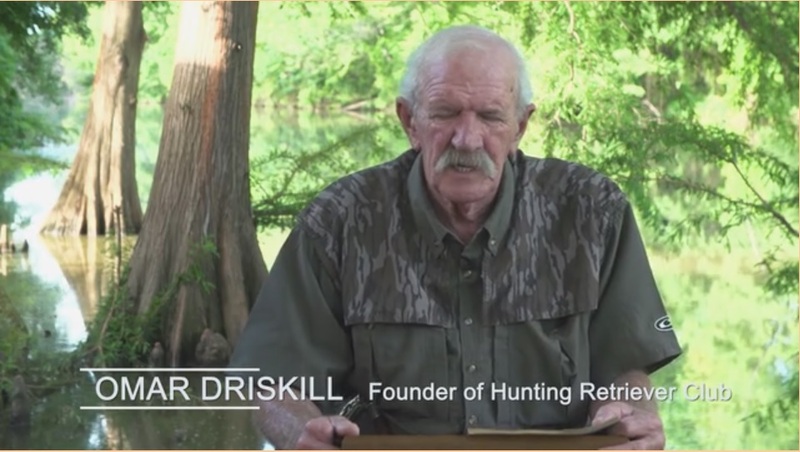 Watch the video to learn some history of retriever sports in general and the beginning of the Hunting Retriever Club in particular. I especially like the comment someone made about misnaming the Started stake. See if you can catch what he thought Started should have been called! Wynk Passed the Working Certificate Test! Wynk got to play on new grounds on Sunday where she earned her WC! The Working Certificate test was hosted by the Labrador Retriever Club of Greater Denver. The property, near Franktown, was nicely set up for retriever training and lots of people and dogs turned out for fresh air and some rather ‘moist’ skies! The WC is a very basic retrieving test. The judges have you bring your dog up, on leash, and then hold them by the collar while someone throws a duck. Release your dog and he brings the bird back to you. Easy-peasy! Then you do the same thing on water, twice. The test was originally designed for show dogs to prove they have the retrieving instinct, even if they never get to hunt. For Wynk it was just another fun day because she’s already proven herself in the field. She started off with one mark on land – near the top of a little hill – no problem. But there was something new, something she’d never seen before. A blind (camo fabric) out in the field, hiding people. ‘What’s that?,’ she asked. So she had to go take a peek and say hello to the bird boys. Then remembered she had to get her bird back to mom! Scooped it up as she ran back and delivered to hand. Land portion completed! 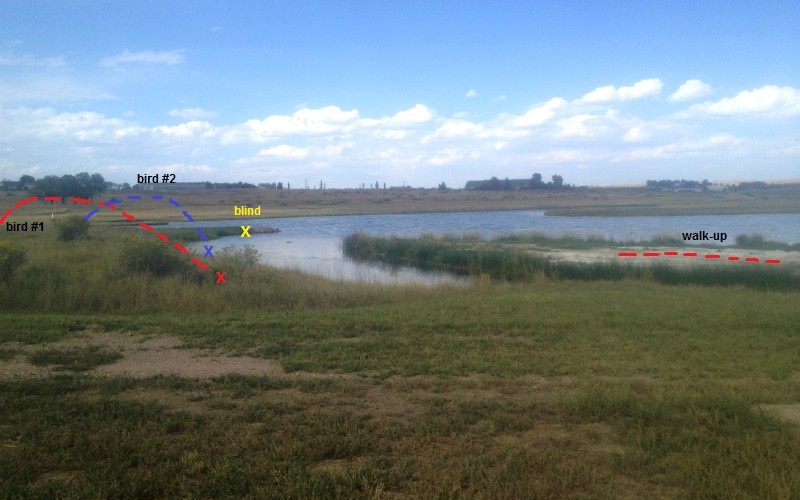 After a bit, we worked the water portion – back to back retrieves in a pond enclosed by tall reeds and other vegetation. Another new experience for her. Out and back, delivered to hand for each mark, with her signature squeal as she left the line. Quite proud of my little Lab! Thanks to Linda Alexander for the great photos! We ran in the hunt test at Indian Meadows in Snyder, CO on May 5-6, 2018. Thanks to Platte Valley HRC for hosting the event! Tisket only needed two passes to complete her Started Hunting Retriever (SHR) title, so she was entered both days. The first land mark on Saturday was in fairly heavy cover and a bit shorter than what we’d practiced. Many dogs, including Tisket, overran the mark and had to work their way back, while honoring their noses. Tisket ran back and forth in the area where she thought the bird had dropped, in an effort to pick up the scent. You could tell when she did catch the scent because her nose looked like it had been snagged by a fish hook. She ran straight to the second mark – “stepped on it” – and brought the bird back to me. The land marks were done, next up were the water marks! The water marks were set up at the end of a spit of land. The first mark was to the right and across a channel into a marshy area to give a slight splash when the birds landed. 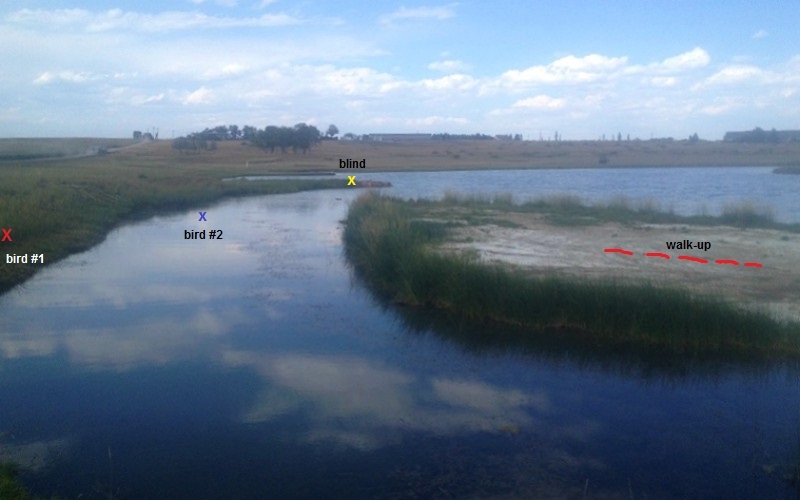 The second mark was to the left in open water on a good-sized pond. Tisket did great on the first mark, except she had to check the decoys on the way back. She never dropped her bird, but had to bump each decoy with her nose to make sure it wasn’t real. The open water swim was out and back, despite the slight chop due to the wind. On Sunday we started with the water marks and Tisket’s daughter, Wynk, got to run her first hunt test. Both marks were across a channel – wider than yesterday’s location – and onto a sandy bank with sparse grass. Tisket was out and back quickly on both birds. Very nice retrieves. Wynk came out raring to go! There wasn’t room for a running start, but she leaped into the water with a big entry and picked up each bird in turn. No time wasted hunting around – she knew exactly where her birds were. On to the land marks for both girls! It was hot and starting to get muggy with a thunderstorm brewing to the west by the time we got the land series set up. Didn’t bother either girl in the least. Tisket ran first again. Out, scoop up the bird and back in no time. The second bird landed in a little swale and she overran it by a yard or two, but turned quickly, scooped it up and back to me. No question that she picked up another pass and that was enough for her title! Wynk came out raring to go again. Good, because I was wilting with the heat and humidity. Although she’s not very tall, she motored her way to each mark and surprised a few people with her speed. Out and back quickly on the first mark. Slide and turn as she tried to pick up the second bird without stopping. No question; she likes this game! Tisket finished her title, Wynk got her first pass and my truck didn’t stay stuck for long! Enjoyed dove opening day with my friend, Tom Osborne! And of course we had Arwen and Woody with us doing all the work. Arwen, at 10-1/2, still has what it takes. She not only handled her main duty of fetching the birds we shot, but also worked as a “traffic cop.” In the beginning, the birds seemed to know where we were and took a detour. So, homo sapiens decided to send canis familiaris about 50 yards away to direct the birds our way. It turned out to be a gorgeous evening with lots of birds flying! 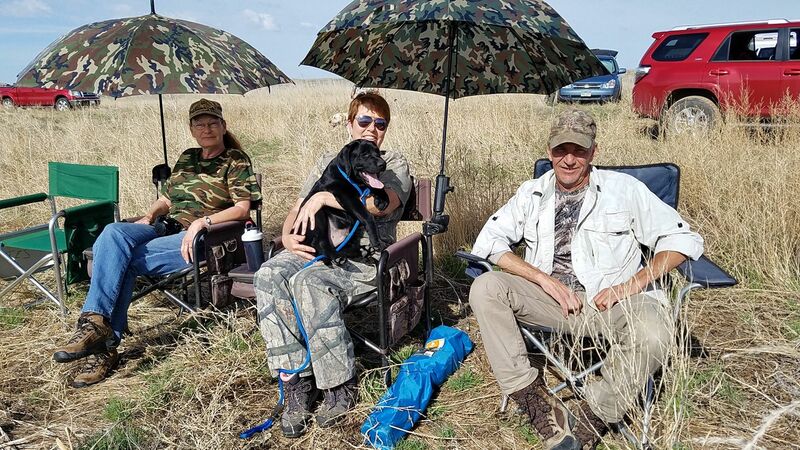 We had a great weekend – despite the heat and wind near Boone, CO. Arwen passed a tough Finished test, Tory passed his 3rd Seasoned test, and Jazzy got to run two Started tests and passed both! The Finished test started with a wide-open triple “dove” hunt and a diversion as the dog was coming in with the last bird. Then a blind retrieve with lots of suction to the dike and old falls. Arwen did fabulously! I, on the other hand, “missed” every bird I shot at. Afterward we decided to try for ducks. This series was a mind-bender of trying to remember which bird is shot at by which handler and which dog gets to retrieve. It started off with a buddy on the honor bucket with his dog as Arwen and I walked down the muddy path to the pond. On the way, a duck comes sailin’ in from the left. Both handlers take a shot at it, but remembering not to shoot in the direction of the other handler! The honor dog picked up that bird while the working dog had to watch. Once we got settled on a bucket, a duck came in from over our right shoulder and quickly thereafter another duck came in from the left. Both handlers shot at the birds. Arwen picked up the left bird after a long swim and then rooted the right bird out of the reeds. Somehow with all that “shooting” we put down another bird way off to the left. The line to the blind was just off the beach with suction to the shore and to the old fall. Couple whistles and Arwen picked up that bird. Time for a new “buddy.” As he came down the path with his dog, we moved to the honor bucket. But this dog was amped! When he came into sight Arwen must have figured she’d need a headstart to beat him to HER birds and took a few steps toward the water during the double, but luckily decided not to go any further! Good dog! English Labs, American, field-type, show dog – how can there be so many different styles of dogs and all be considered Labradors? My guess is that the breed is just too popular – what is it, 15 years now that they’ve been the #1 breed in America per the AKC? Distinctive styles have evolved to suit everyone’s varying tastes, and I’m not saying that’s a good thing, it just is. The English Labs tend to have heavy bodies, blocky heads and short legs. This is where most of the current show dogs come from. I think they’re a product of the more is better syndrome – the standard calls for a broad head, so let’s make it massive, etc. They’re also a product of what wins – a dog wins Best of Breed at a prestigious show and people sign up in droves to breed to him in hopes of duplicating him and his wins. Unfortunately some of these dogs have become caricatures of the original Labs who were bred to be field dogs. A 120 pound, 22″ dog with profuse coat wouldn’t be my first choice to chase wild ringnecks in South Dakota. On the other hand, American Labs tend to be tall and slender with whip-like tails and lots of energy. These are the field dogs who can spend all day hunting or running multiple marks at tremendous distances and still want more. They too are products of the more is better and the whatever wins syndromes. These dogs are generally bred for their abilities rather than their looks – trainability, marking ability, and intelligence. 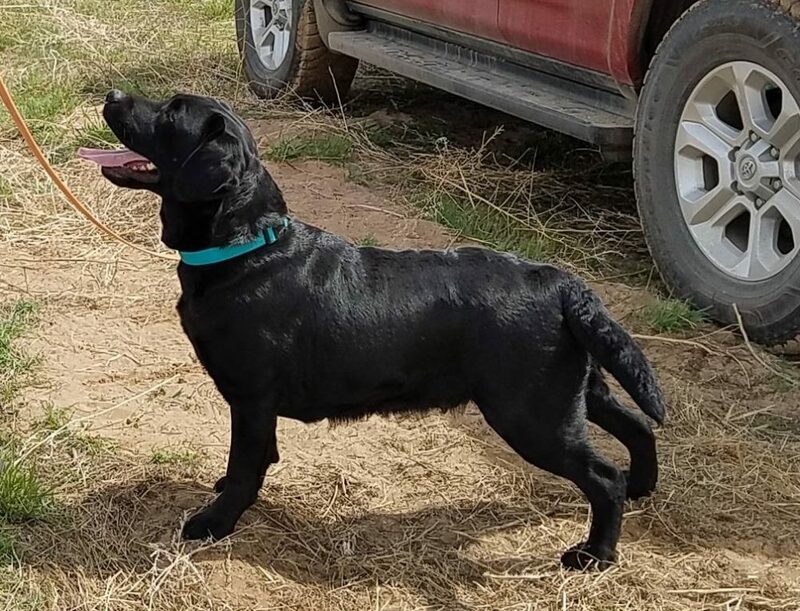 These breedings are all about trying to produce field trial winners with less regard for the dog’s structure or appearance. I’ve seen an adult female Lab who had the height, bone structure and even head shape of a Whippet. I’ve also seen a huge adult male Lab who had heavy bone, massive head, thick coat and, except for the height difference, could have been mistaken for a Newfoundland. To be fair, dogs from both ends of the spectrum fill particular needs and are loved and cherished by their owners. Plus there are many dogs that fall somewhere between the two extremes. 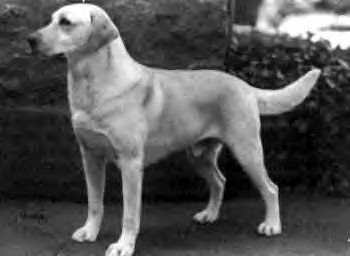 However the extremes are quite different from the classic Lab – a medium sized dog who loved to retrieve. 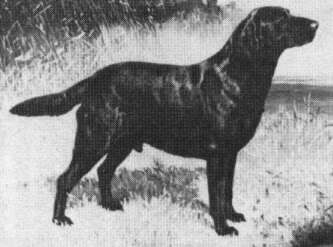 First, is Dual CH-NFC-AFC-Can CH Shed of Arden, (the black dog) a great Lab of the past. He not only earned a show championship in two countries, but was also a three-time National Field Champion! Shed was not so tall and lanky as many of the field dogs of today, nor was he so blocky as most of the current show dogs. Another great from the past was CH Shamrock Acres Light Brigade. “Briggs was an outstanding show dog and sire. He produced 93 AKC Champions and won 12 Best in Show awards and 75 Sporting Group placements.” Compared to show dogs today he had way more leg and less substance, but look at those shoulders and the balance! I’d bet he moved exceptionally well. By the way, most of my dogs have both of these famous boys in their pedigree! I am happy to see some progress – or at least interest – in returning to the moderate Lab, one not overdone or underdone in body style and that still has the desire to retrieve. A well-respected, long-time show breeder told me recently that the dog can be pretty, but MUST have the desire to retrieve to be a true Lab. I’m trying to work with Breaker a little each day though it’s tough to do all this with just the knowledge I’ve gotten from Joe, Brian and yourself. I’m trying as best I can! I hope to see you again soon!! For Breaker, just keep working on the basics. Work on obedience – heel, sit, come and down. You can do this at home. Throw marks in different areas and different lengths (watch out for snakes). If he has any trouble with longer marks, see if you can get someone to help by throwing. Pick out a nice place with fairly short cover and at least 100-150 yards of open area. Have your thrower stay at the same place while you move back with each throw. Start at a distance a little shorter than his best comfort zone – maybe 30 yards – have him sit while the thrower tosses the bumper. As Breaker picks it up, you back up about 5-10 yards while encouraging him to come to you. Throw the same mark again and run him from this longer position. If he’s doing well, back up another 5-10 yards as he’s coming to you. Do 3-4 of these at every opportunity and gradually increase the distance. When he’s comfortable out to 150 yards or so on short cover, go back to the shorter distance (30 yards +/-) but this time in higher cover and start increasing the distance again. Probably best to increase by a shorter amount each time because finding bumpers in cover is much more challenging. Also work on his steadiness. Hold his collar, but require him to sit still and quiet until you release him. When he’s doing really well and you think he won’t break, slip a short (~ 2′) length of cord like clothesline through his collar and hold both ends with slack in it so he doesn’t feel you holding him. If he breaks, stop him with the cord and have the thrower pick up the bumper. Try again. Only release him for the retrieve if he stays steady. Also vary the amount of time he has to sit after the bumper lands (1 or 2 seconds up to 6 or 7 seconds on occasion). Also vary the type of ground and cover you work him on. For example, use a ballfield for increasing distance with short cover. Then try to find some place with plenty of cover. Look for a small ditch – but make sure it’s very visible to him. Look for a creek or pond. Look for a hillside and throw marks up, down and across (not in the same session tho). Try throwing downwind and crosswind marks (not into the wind because he will smell the bumper early and could start quartering). Basically give him experience picking up bumpers and birds in as many situations as you can find. When he’s doing well and has all his teeth in – he should by now – you can start on force fetch. Some dogs will need to stop picking up marks until force fetch is completed just because they get pissy over HAVING to pick up something. Other dogs don’t care. Just make sure once you start force fetch you see it through to the end, otherwise the dogs wind up learning they don’t have to fetch and won’t fetch unless they feel like it. Tough to correct!